One of the first orders that Deputy Chief Minister Sisodia signed sought to restore the powers of the ministers to transfer officials. The Aam Aadmi Party government got down to business right after their huge victory in the Supreme Court and directed officials to expedite projects like installation of CCTV cameras and doorstep delivery of ration. One of the first orders that Deputy Chief Minister Sisodia signed sought to restore the powers of the ministers to transfer officials. But within hours, Deputy Chief Minister Manish Sisodia was told that his order cannot be implemented, sources said. Sources told NDTV that the services department has told Manish Sisodia that there was nothing in the Supreme Court verdict that cancelled the August 2016 order issued on the Lieutenant Governor's instructions. The rejoinder came as a huge setback to the Kejriwal government that had been celebrating Supreme Court order that Delhi's Lt Governor was constitutionally bound by the "aid and advice" of the elected government. L-G Anil Baijal will be meeting Delhi Chief Minister Arvind Kejriwal tomorrow. AAP spokesperson Saurabh Bharadwaj tweeted a 3-page response to Arun Jaitley for his interpretation of the Delhi verdict. Have directed again Secretary Services to issue the orders as directed yesterday. Informed the officer that non compliance would lead to contempt of SC and the officer shall face disciplinary proceedings. After reading @arunjaitley blog on SC verdict I am convinced that Mr Jaitley is a constitutional anarchist. Like his leader Golwalkar/Modi and RSS ideology he has no faith in Constitution. Day after Supreme Court gave its verdict in the AAP Government versus L-G fight, Delhi Chief Minister Arvind Kejriwal wrote to Anil Baijal today. He said Lt-Governor's "concurrence would now not be required on any matter". "Judicial discipline to abide by declaration of law by this Court, cannot be forsaken, under any pretext by any authority or Court, be it even the Highest Court in a State, oblivious to Article 141 of the Constitution of India, 1950 (in short the 'Constitution')," he wrote in the letter. The MHA notification might not have been quashed by constitutional bench but it will be done by DB. In the light of the above judgement, can LG still exercise executive powers over services? If he does that, he will clearly be in contempt of SC. The Delhi government is taking advice of lawyers to plan way forward, Deputy chief minister Manish Sisodia said. "Till then, we request all to work in good spirit as advised by the Supreme Court," he said. Now, as far as the services department is concerned, I do not think the LG will sign transfers anymore. I do not think he will disobey the orders of the Supreme Court. On the other hand, officers say that according to the existing rule they take orders from the L-G. So, if they cannot take orders from the Delhi government and the L-G cannot sign anymore, where does it leave us? Does it mean that we are stuck? Do that mean that we are stuck? Delhi Dy CM @msisodia addressing an important Press Conference, Right now. "Supreme Court has clearly said that Union government has powers only in 3 areas - Law and Order, Police and Land... Even in transfers, the Centre can make decisions only in transfers related to the 3 areas which are with them... Apart from that, all other work and transfers of all other departments is with the Delhi government". Deputy Chief Minister of Delhi @msisodia will brief the media on an Important Issue. 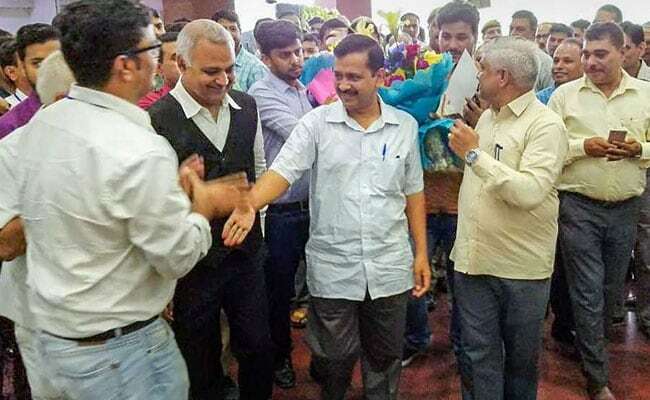 Chief Minister Arvind Kejriwal and his deputy Manish Sisodia got down to business right after the Aam Aadmi Party government's huge victory in the Supreme Court on Wednesday." SC has clearly said that centre has executive powers ONLY on three subjects and no other subject. Council of Ministers (COM) has executive powers on all other subjects. There is absolutely no ambiguity in this. So, obviously executive power over services lies with COM. Delhi Services Department refuses to abide by @msisodia order, says 'government can't take transfer decisions'. This is a clear violation of the Supreme Court order. The department has also indicated that the Lt Governor and top bureaucrats would continue to decide on transfer and posting of officials till the 2016 directive is either cancelled by the court or replaced with a new order pre-approved by Lt Governor Anil Baijal. The Delhi services department, which decides on posting of officials, has bluntly told Deputy Chief minister Manish Sisodia that his order on transfer of officers cannot be implemented. Sources told NDTV that the services department has told Manish Sisodia that there was nothing in the Supreme Court verdict that cancelled the August 2016 order issued on the Lieutenant Governor's instructions.